There is something so satisfying about creating a frugal recipe that the whole family loves. Especially when that recipes helps you make a dent in the zucchini harvest! This recipe makes use of several vegetables from the garden: zucchinis, tomatoes, corn, onions, and peppers. All of the garden veggies make it an especially frugal dish. However, if you didn’t garden this year you will probably find all of these veggies on sale in your grocery store right now. You can use fresh corn, canned corn, or frozen corn in this dish. I like to serve meatless meals a couple times a week. It is an easy way to save money on my grocery bill. The beans and rice make this dish so filling, you will never miss the meat. 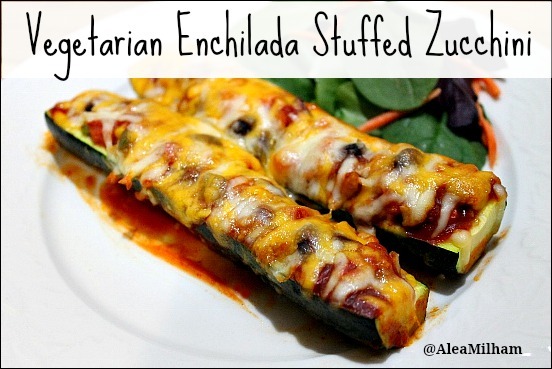 Enchilada stuffed zucchinis come together fast! I already had cooked rice and beans on hand, so it took me less than 15 minutes to prep the dish. Since the zucchinis won’t get soggy, you can prep this dish the night before. Which is really nice for busy school nights! You can come home, pull it from the refrigerator and plop it in the oven. It cooks in 30 minutes. I serve it with a garden salad. Cut the zucchinis in half length-wise. Scoop out the seeds. In a bowl, mix together rice, beans, tomatoes, corn, onion, peppers, and taco seasoning. 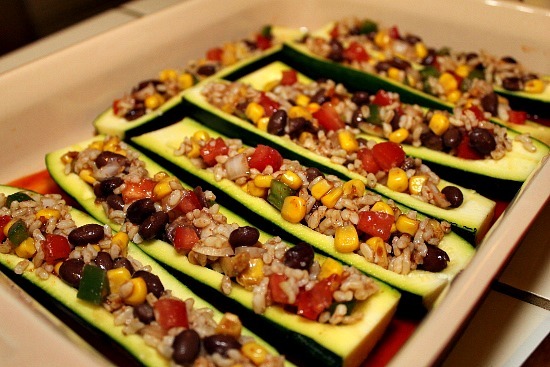 Fill the zucchinis with the rice and bean mixture. Spoon a little enchilada sauce into the bottom of a casserole dish. 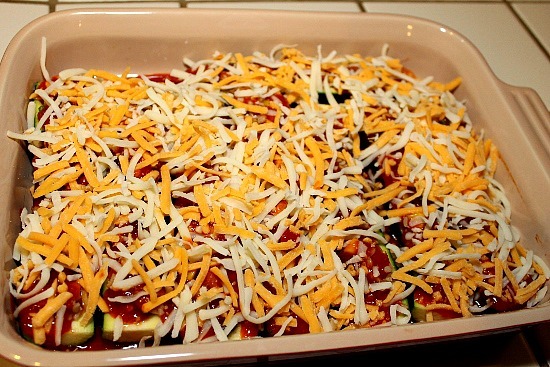 Place the stuffed zucchinis in the casserole dish. Spoon the enchilada sauce over the zucchinis. Sprinkle the cheese over the top. How are you using up your excess zucchinis? This recipe sounds fantastic! Yet another way to make good use of the abundance of zucchini I’ve got on hand all the time at this time of year. 🙂 When worse comes to worst, I’ve been dicing my squash up and freezing it for later use — what seems like Too Much now will seem like Just Enough come autumn and winter! My freezer’s getting a little full, though, so this will be a perfect way to use up some zucchini in real time. 🙂 Thanks! I was anxious to try this recipe and made it for dinner tonight, it was so tasty! My husband who is non-vegan really liked it, said the flavors were perfect. I’ll definitely be making this again. Love that it’s healthy too.